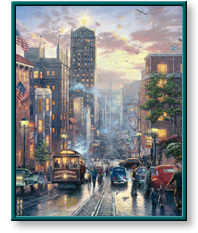 San Francisco, Powell Street and other artwork by artist Thomas Kinkade can be viewed in our artist slideshow. San Francisco, Powell Street by artist Thomas Kinkade and other Thomas Kincade art, art work, artwork, canvases, giclees, images, limited editions, open editions, paintings, paper, pictures, posters, and prints can all be found at Christ-Centered Art. "As you may know, my heart resides in the City by the Bay. San Francisco, Powell Street marks the 19th release in my San Francisco collection, yet this wonderful town continues to provide breathless panoramas even for a seasoned visitor. Perhaps that's because San Francisco is such a lived-in city. Wherever you look you find dynamic street life — vendors, neighbors, shoppers, and the ever present cable car. "San Francisco, Powell Street gives me an opportunity to return to the hilltop I first painted in my tremendously popular San Francisco, A View Down California Street from Nob Hill, but looking in a different direction. I've taken artistic license to move the wonderful Bay Bridge slightly south to provide a full view — after all, what would the City by the Bay be without a bridge in the distance. In the middle ground, we see the Sir Francis Drake Hotel with its famous Starlite Roof, adorned by its landmark spinning star atop the stately main tower." Add $230 to frame this canvas. Image Size 40" x 32"
San Francisco, Powell Street by artist Thomas Kinkade as well as other open and limited edition inspirational paper art prints and canvases, giclees, images, lithographs, paintings, pictures, posters, and reproductions by renowned Lightpost Publishing, Media Arts, and The Thomas Kinkade Company artist Thomas Kincade can be viewed and purchased at special sale prices at Christ-Centered Art.